When a dog gets hurt, the common thing it does is to lick the wound. That’s what the Bulldog Nation was doing Saturday night. Doggone, this loss to Alabama really did hurt, as in Jalen Hurts. After losing the national championship game in January, the Dawgs were growling for a chance of redemption. In the 2018 SEC championship game, on the same Mercedes-Benz Stadium turf, another backup quarterback rallied the Crimson Tide. Georgia’s hopes of a back-to-back league title and another shot at a national crown were swamped. Last January Tua Tagovailoa came off the bench to engineer an overtime victory for Bama. Eleven months later, Tua hobbles out. Jalen Hurts trots in. A different Tide quarterback sang the second verse of the same song. The good news is that the sun did come up Sunday morning. We can quit licking our wounds. The coulda-woulda-shoulda fretting won’t change the score. Here’s how I’m managing the disappointment. I’m calling up instant replays from 1965 and 1990. Good memories help me suppress bad memories. I don’t care how many times I’ve heard about the Kirby-Moore-to-Pat-Hodgson-to-Bob-Taylor flea-flicker play, I want my friend, Kirby, to keep telling it over and over. That was the year before I got to UGA. 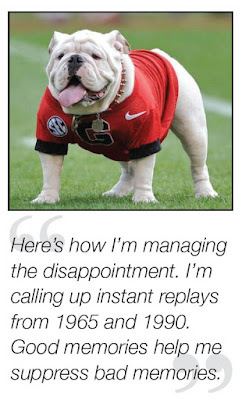 Still I was listening to the game—stretched out on the carpet of my parents’ living room at 187 S. Ninth St.
On that glorious Saturday, Sept. 18, 1965, Vince Dooley’s Dawgs stunned Bear Bryant’s Tide, 18-17. And when Kirby retold the story in January—while a group of us were watching the national championship game—I got goose bumps all over, again. Just like a Goody’s headache powder, I pulled out that flashback Saturday night, when the clock was drained and the scoreboard read 35-28. It almost stopped my temples from thumping, but not quite. That’s when I dialed up another classic victory over the Tide, 17-16, on Sept. 22, 1990. On that Saturday afternoon, I was sitting near a classmate, Billy Payne. The former student-body president and All-SEC Bulldog defensive end had just returned from Tokyo. His dream had come true. Atlanta was going to host the 1996 Olympics. Without breaking stride, he laughed and said, “Sure thing, Dink.” During his chamber of commerce banquet talk, he mesmerized Wayne County with the back story leading up to that historic announcement. And, yep, that still gives me goosebumps, too. And as I sit here, I can see Sunday’s sports page of The Atlanta Journal-Constitution. The headline reads: “THIS ONE HURTS.” Yes, it does. But I’m done licking.